Heat oven to 350°F. Place butter in 13x9-inch (3-quart) glass baking dish; place in oven until butter is melted. Remove baking dish from oven. Sprinkle brown sugar evenly over melted butter. Sprinkle coconut over brown sugar. Arrange pineapple slices over coconut, pressing lightly to set each one in place. In large bowl, place cake mix, reserved 2 tablespoons pineapple juice, the coconut milk, oil and eggs. Stir vigorously about 2 minutes or until well combined and batter is smooth. Let stand 2 minutes; stir again. Pour batter into pan, spreading evenly. Bake 40 to 45 minutes or until toothpick inserted in center of cake comes out clean. Immediately run knife around sides of baking dish to loosen cake. Place cookie sheet upside down over baking dish. Turn cookie sheet and baking dish over; leave baking dish over cake 5 minutes to let brown sugar mixture drizzle down onto cake. Remove baking dish; cool 30 minutes before serving. Store in refrigerator. 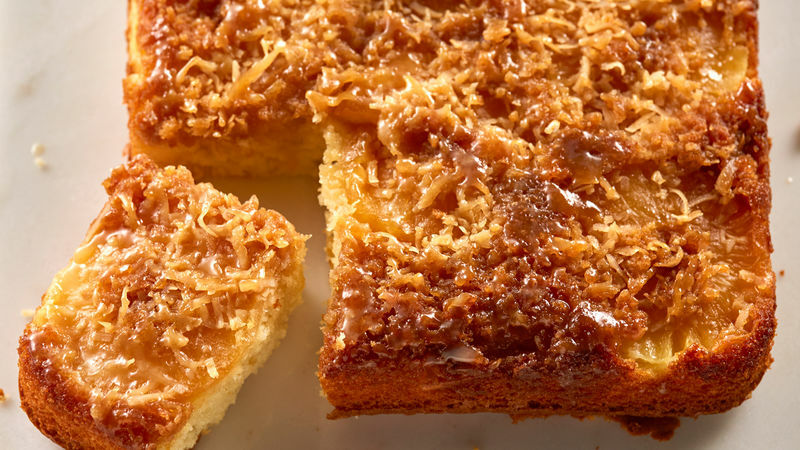 Though this cake is virgin, you can add a shot of coconut rum to the batter for added fun. This cake can be eaten warm from the oven or cold from the fridge.